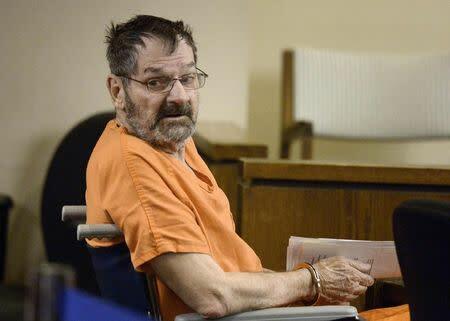 OLATHE, Kan. (Reuters) - A man who admitted in court to wanting to kill Jews was found guilty on Monday of murdering three people, including a teenage boy, outside two Jewish centers in Kansas last year. Jurors will next decide if Cross should get the death penalty, as prosecutors are seeking. The penalty phase is set to begin on Tuesday. Cross, who acted as his own attorney at trial, admitted the killings on the witness stand, and said he was motivated to kill Jews because he believes they have too much power and are destroying the white gentile race. Prosecutors charged Cross with murdering Reat Underwood, 14, and Underwood's grandfather, 69-year-old William Corporon, outside the Jewish Community Center of Greater Kansas City, as well as 53-year-old Terri LaManno, 53, outside a nearby Jewish retirement home. Both the facilities are located in Overland Park, Kansas, a suburb of the Kansas City metropolitan area. Corporon and Underwood were shot at close range in the parking lot outside the Jewish community center. Corporon had taken his grandson there to audition for a singing competition. The shooter then drove to the nearby retirement home where he encountered LaManno, who was there to visit her mother. Cross said he did not find out until days after the murders that none of his victims were Jewish. He expressed remorse only for killing the boy. "Everything I did was for you, for your children, your grand children and for future generations of our people," Cross told the jury. After the guilty verdict, Cross said he was a "little disappointed" about the outcome. Family members for some of the victims were in the courtroom for the verdict but declined to comment.